It is also served as sawsawan or dipping for green mango and grilled or fried fried fish. So what can we get from eating this “Binagoongang Baboy”? Basically, shrimp used in making the bagoong alamang has antioxidant and anti-inflammatory properties which is good on reducing immune related problems of diabetes. Furthermore, shrimp adds cancer-fighting minerals in your diet. 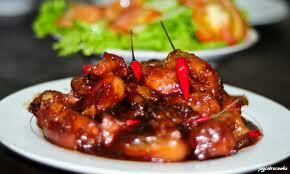 Shrimp pastes were salty so be watchful on adding more, because too much of it might ruin your dish. Also, be careful on adding chili paste. Though chili food’s a bit more enticing, too much of it also, won’t do any good on your dish. So, just follow the instructions below, carefully and I assure you, you’ll do the best binagoongang baboy! Get ready for a nice cooking! In a casserole, boil pork and lower fire until waterevaporates and pork oil starts to come out. When pork is lightly crispy, put in on the side andsaute garlic, onion, tomatoes and chili peppersin the fat and mix pork once more. Add in the bagoong and cook while stirring for 5minutes. Pour in the vinegar and stir well. Add in the sugar and let simmer for 10 minutes orjust until cooked.